Scenes along the Lower Falls Trail in Golden Ears Provincial Park – on the way to Lower Falls on Gold Creek. I have photographed the scenes I’ve found along the Lower Falls Trail on many occasions. 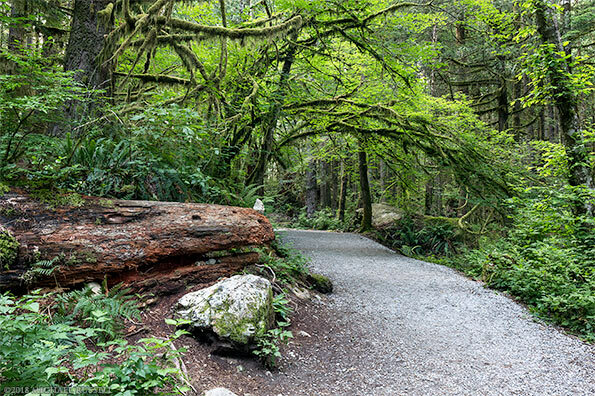 The trail winds through the rainforest in Maple Ridge’s Golden Ears Provincial Park on the way to Lower Falls which I have also photographed many times. Lower Falls is the most popular photography spot along the Lower Falls Trail, but I think the view of the Golden Ears and Gold Creek near a bend in the creek is a close second. This first photograph here might show the third most popular spot – the “Dragon” log next to the trail. This log looks a bit like a dragon’s head, and I’ve heard many people refer to it as such. Normally there are also various rocks (like the pointed on in this photo on the end of the nose) that add to this look. There was a rock in the log for its eye when I passed the first time but it was gone when I came back and photographed it. These overhanging Vine Maple trees (Acer circinatum) are a nice photography opportunity as well, and are the same Vine Maples you see in the first photo above of the dragon log. I did prefer the Lower Falls Trail more in the past when there was a natural trail here, and not crushed gravel, but at least the bears/cougars can hear you coming with the constant crunch crunch sound that walking makes! These last two scenes – Red Alders (Alnus rubra) and a view of Gold Creek with Mount Nutt in the background, are near the bend in the trail/creek I mentioned earlier. When I see scenes like this one with the Alder trees I do wish they would turn a nice color in the fall. Alder leaves, sadly, just sort of go brown and fall to the ground which doesn’t really lend itself to nice fall foliage photographs. 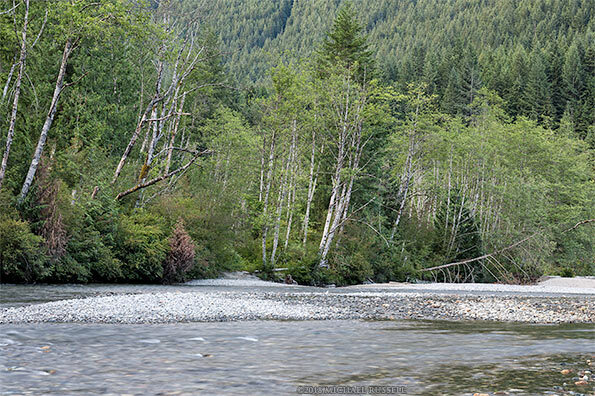 I photographed these trees at the unnamed beach that is quite popular in the summer for swimming in (the probably cold) Gold Creek. For more photographs of this park visit my Golden Ears Provincial Park Gallery. 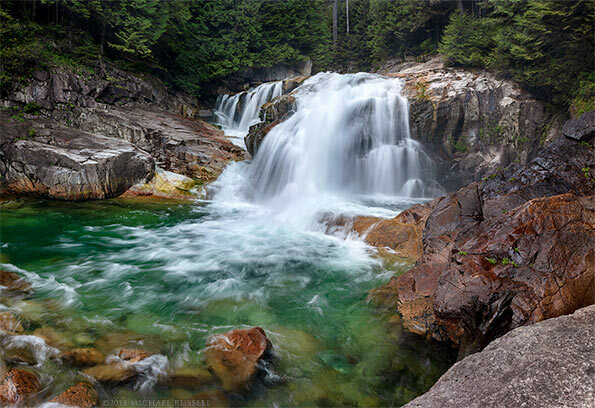 A Summer evening at Lower Falls on Gold Creek at Golden Ears Provincial Park, Maple Ridge, British Columbia, Canada. A few years ago I photographed Lower Falls in Golden Ears Provincial Park during a period in June where there was relatively little water flow over the falls. I really like that photo but since then I’ve wished I had a photo of Lower Falls with higher water levels. During the winter and at the height of spring runoff – the water flowing over the falls consumes almost the whole width of the area. This can be quite a raging torrent, and the spray the wind may blow in your face can make both viewing and photography difficult. This year I thought that the amount of rain and the snowpack we had would sustain a higher flow than I’d photographed back in 2015, and I was correct. The photo above shows a more typical view of Lower Falls than that older photo. 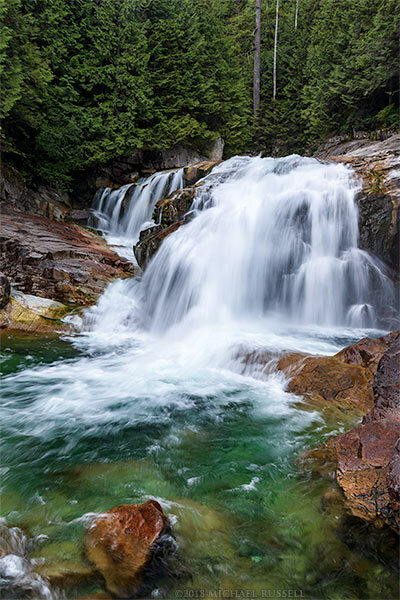 June is also my preferred time of year to photograph Lower Falls as the kids are still in school, the heat of summer isn’t yet here, and camping season hasn’t reached its peak. I’ve been to this falls on a hot summer evening and it would be nearly impossible to photograph as the place is covered in people. In June most are smart enough to not venture into the pools above the waterfall (people dying or being injured here has happened way too often) as the water flow is still quite high. Later on, however, the amount of swimmers makes any photography nearly impossible – so I’d recommend early – mid June as the perfect time for photographing these falls. If you get your timing right, you can also photograph some Streambank Arnica near the falls as well! I talked to someone from Toronto while I was photographing Lower Falls. 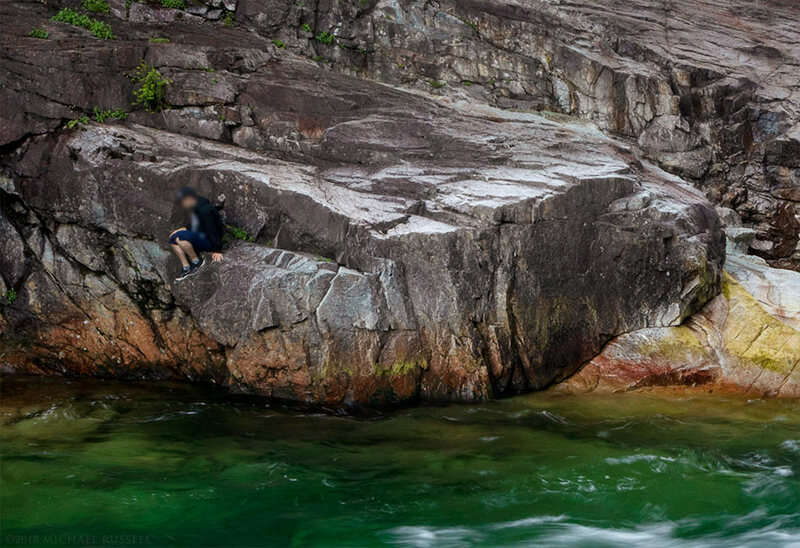 His friend, and I don’t know what would possess someone to do this, hopped across the boulders downstream and wound up on the opposite side of the river from the falls. When he emerged from the forest he slipped and fell. I thought he was going to slide into the water, but he caught himself before he did, though his phone was not so lucky. The photo below shows where he slid, and the eventual path of his phone into the water. It did land in a fairly shallow part of the creek, however, so he spent about 10 minutes trying to determine how to climb down and retrieve it. This all seemed to me like I was about to watch someone die so I pointed out to his friend who had stayed on the viewing platform side of the river that many people have died in this spot when the current was more than they could handle. Despite a few calls to leave the phone, the guy jumped into the water near his phone (after taking off his shoes and socks) and retrieved it. The jump looked bad enough – but I had no idea how he was going to get back out! When I left he was still contemplating this, and had tried several routes out of there that had not been successful. I decided to leave. There was nothing I could do to help, and I didn’t want to watch anymore. As there were no stories in the news the next day I presume he found a route out and hopefully without injury. His phone was unlikely to be as lucky, as it was submerged for a good 10 minutes. I have to say that while photographing these falls I made a number of mistakes I wouldn’t normally make, and the cell phone guy distraction is the excuse I’ll use this time. I did encounter some blowing mist/spray that was problematic. It was nice to know I had a weather sealed camera and lens, though I don’t get them wet on purpose and still wipe them down as much as possible. While talking to the fellow from Toronto and watching his friend risk his life for his phone… I failed to wipe as much spray off my front lens as I should have. Unfortunately this meant that a number of compositions were not usable which was entirely preventable. The photo above does have some spray effects you can see in the trees along the top, but most were much worse. I would normally consider that photograph non publishable but it did show the area where he fell better than other images. I may go back and try my luck here in a few weeks. Even if there are too many swimmers in the water – it is a great, short hike through a scenic area – and that is always worth it. 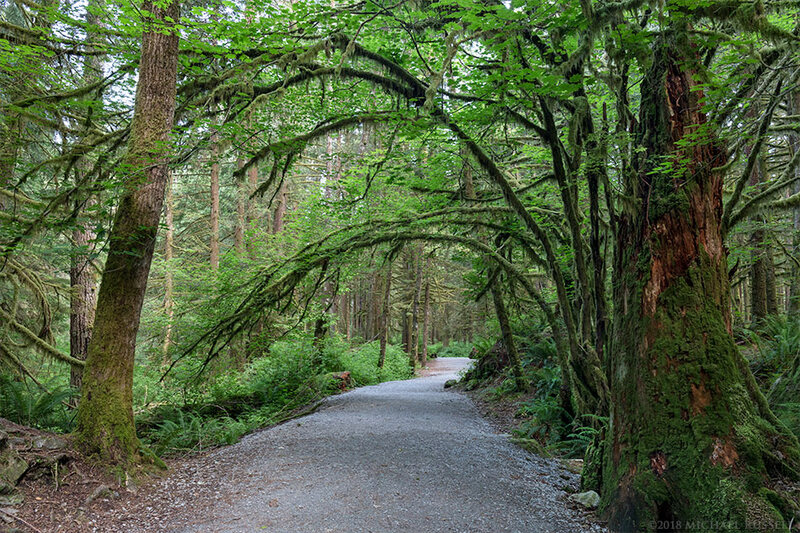 More photos from this park can be found in my Golden Ears Provincial Park Gallery. 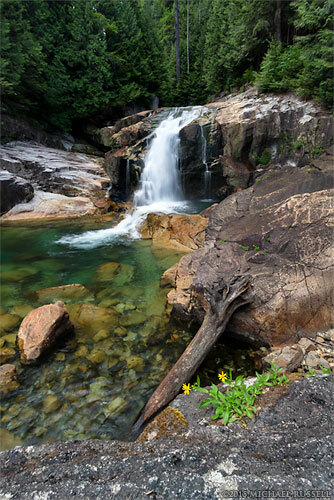 I have a batch of newer images from this location in this post: Lower Falls in Golden Ears Provincial Park. 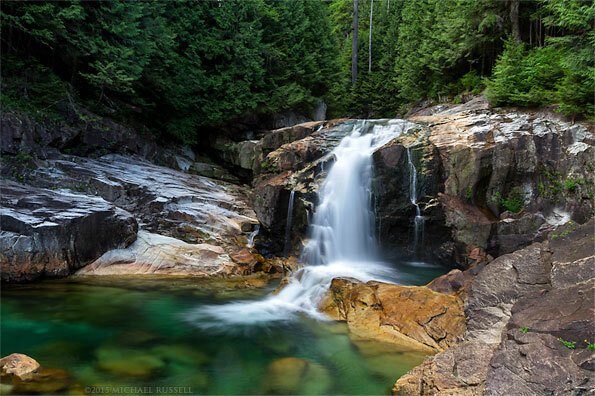 Lower Falls and the emerald pools of Gold Creek at Golden Ears Provincial Park in Maple Ridge, British Columbia, Canada. One of the easier hikes to do in Golden Ears Provincial Park is the Lower Falls Trail (map) along Gold Creek. The trailhead is easy to find at the northwest end of the parking lot (the grey spot just after the Gold Creek Bridge on the map linked earlier). This hike is only 5.5km (round trip) and has minimal elevation change which makes it much more accessible than some of the other trails in Golden Ears Park. The trail has also been upgraded in recent years, so much of it is crushed gravel. Personally I dislike walking on crushed gravel and prefer a natural trail even with tree roots, slugs and the occasional puddle. I guess the resurfacing does have some benefit in initial parts of the trail that were often filled with puddles and mud in the spring and fall, but I would have preferred they left the rest as is. I have previously hiked to Alder Flats on a number of occasions, and while that is a nice hike, it doesn’t have the scenery one gets to enjoy along the much easier Lower Falls Trail. After walking about 1km up the trail from the parking lot I came to the first spot where I stopped for photography. There are many small side trails down to the creek along the entire Lower Falls Trail (be sure to follow those instead of making your own). My first stop was only about 5 meters from the trail and showed a nice summer view of Gold Creek. This looks to be a good spot to stop during fall foliage colors as well. My next stop was probably the most famous spot along the Lower Falls Trail – the viewpoint where one can see Gold Creek and parts of Mount Blandshard. Just before this viewpoint you’ll see a number of side trails to a beach which is a great spot to stop and eat lunch or just relax. After a 10-15 minute walk from the viewpoint I arrived at my ultimate destination: Lower Falls itself. The water levels shown here are probably more typical in late August, but were this low in late June due to our lack of winter snowpack in the mountains and a drought this spring/summer. In normal years this waterfall will be a raging torrent in fall, winter and spring – and can be quite dangerous. I was able to get up on a rock and photograph Lower Falls from a nice vantage point but only due to the lower water levels and lack of strong currents (and depth) in the water below. In far too many of the past years people have fallen into the water at various points in Gold Creek and died as a result. 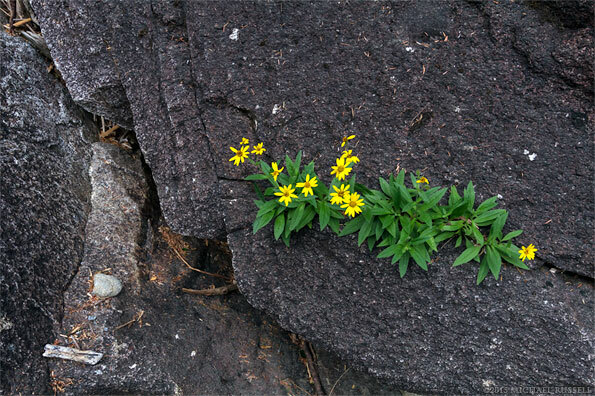 Many of the cracks in the rocks near Lower Falls had Streambank Arnica (Arnica amplexicaulis) growing in them. I was lucky that one of the Arnica plants was in a good position to include in the above composition along with the waterfall. On my way back to the main viewing platform I photographed one of the other Streambank Arnica plants growing in a crack in one of the boulders beneath the falls. 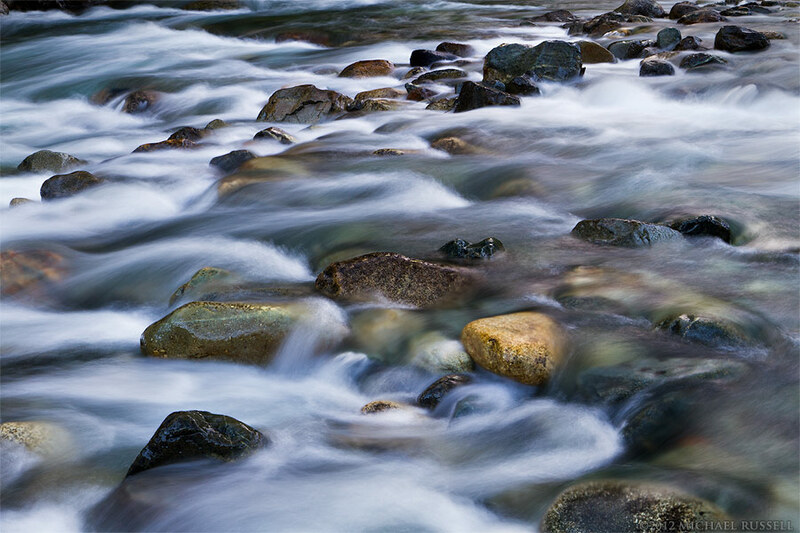 For more of my photographs from the Golden Ears area visit my Golden Ears Provincial Park Gallery. Gold Creek winds through the mountains and forests of Golden Ears Provincial Park in Maple Ridge, British Columbia, Canada. 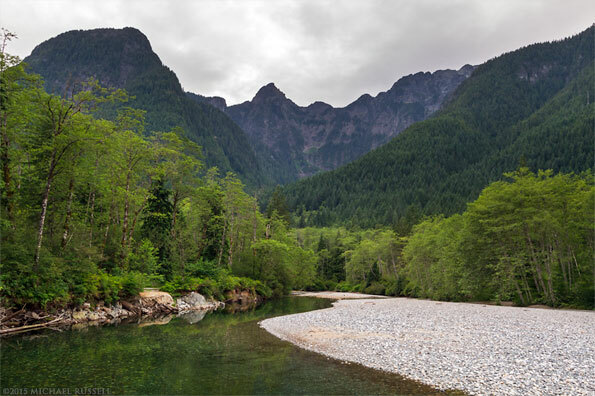 If one were to point to an “iconic” composition from Golden Ears Provincial Park most would choose the second image here, showing some of the peaks of the Golden Ears mountains. While this may be the most popular scene, I decided to feature a slightly different composition in the photograph above. Even without the mountains in the background, I still like the impact of this scene. I have a few different compositions of this, but I think the wider panorama above shows off the area more effectively. In conditions where there were clear skies and/or some snow on the mountains, I think the bottom scene might prevail. I have previous photographed this area, but never really have encountered “perfect” conditions for doing so. I had planned on photographing this area in the snow last winter, but snow wasn’t really part of our 2014/2015 winter unfortunately. I headed to Golden Ears Park a few weeks ago on a cloudy day, as I knew my main goals were wildflowers, waterfalls, and Gold Creek itself. When I reached this view, about half way to Lower Falls along the Lower Falls Trail, I decided that the iconic view was worth a photograph regardless. The slight haze in the sky and the clouded background still allowed for enough contrast to photograph Evans Peak (left) and Edge Peak behind the foreground of Gold Creek and the many Red Alder (Alnus Rubra) trees lining the edge of the forest. Which one of these compositions do you prefer? Do you think the second composition here is effective despite the imperfect conditions in the sky? For more of my photographs from this area visit my Golden Ears Provincial Park Gallery. Gold Creek winds through the trees and rocks at Golden Ears Provincial Park in Maple Ridge, British Columbia, Canada. Golden Ears Provincial Park in Maple Ridge, British Columbia has almost all I want in a photo location – everything from tall mountains and forests to creeks, lakes and waterfalls. A few weeks ago I spent an afternoon and evening hiking and photographing in Golden Ears Park, mostly along Gold Creek. The first photo above shows Gold Creek along the Lower Falls trail in a spot where I had intended to stop and take a water break, but ended up photographing as well. Downstream from Gold Creek Bridge the bed of Gold Creek narrows into a rock lined “canyon” with fewer boulders to stir up the surface of the water. 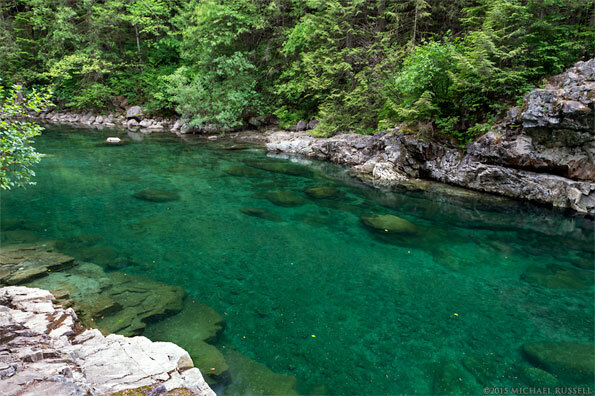 The emerald green pools of the creek are on full display in this stretch up until it empties into Alouette Lake at North Beach. The colours here are from minerals suspended in the water from its journey down from the mountains. This photograph was made along the North Beach Trail in one of the few pools I was able to find not filled with swimmers and boaters. The water levels here are what you would typically see in late August, but due to drought were at this level in late June. This did make for my best time shooting at Lower Falls, but I’ll make that its own blog post coming soon. 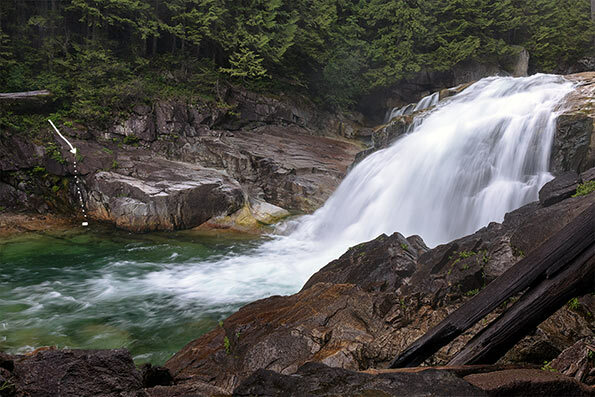 A few weeks ago I headed to Golden Ears Provincial Park to hike to Lower Falls on Gold Creek. The trail was very muddy, and hard to walk on for much of the way but it was one of the first really nice days this Spring. To be out walking without the heavens pouring down was nice. I was never able to find the trail from Lower Fall to the above trail that I had intended to hike though. This gave me more time to make photographs between the Gold Creek bridge and Lower Falls. 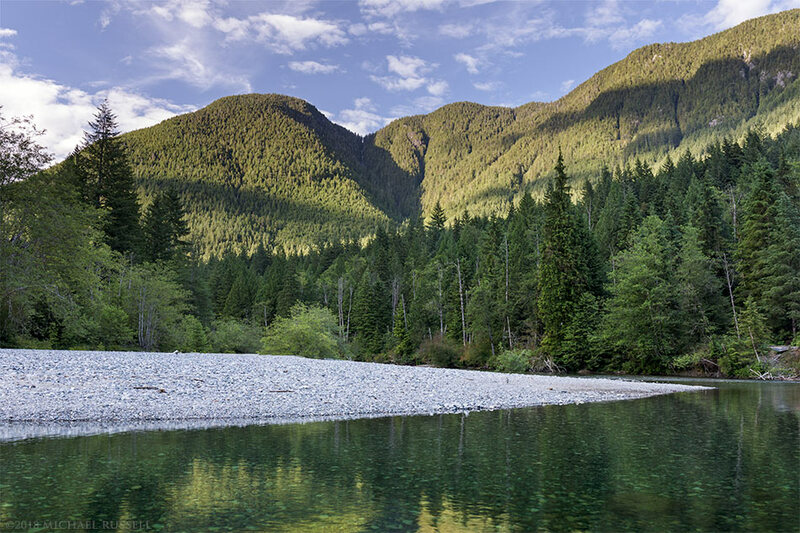 I made this photograph next to the Gold Creek bridge at the end of the Golden Ears Park road. Gold Creek is pretty wide in parts at this location, and while I did concentrate on some details of rocks and ripples, this wider view shows the overall look of this part of the creek.